Attention, Hallmark movie fans—Christmas movies are here! Hallmark’s Countdown to Christmas 2018 kicked off Oct. 26. This year Hallmark has made a record 36 new movies, airing on both Hallmark Channel and Hallmark Movies & Mysteries (channels 66/666 and 103/703 in your BendBroadband lineup). 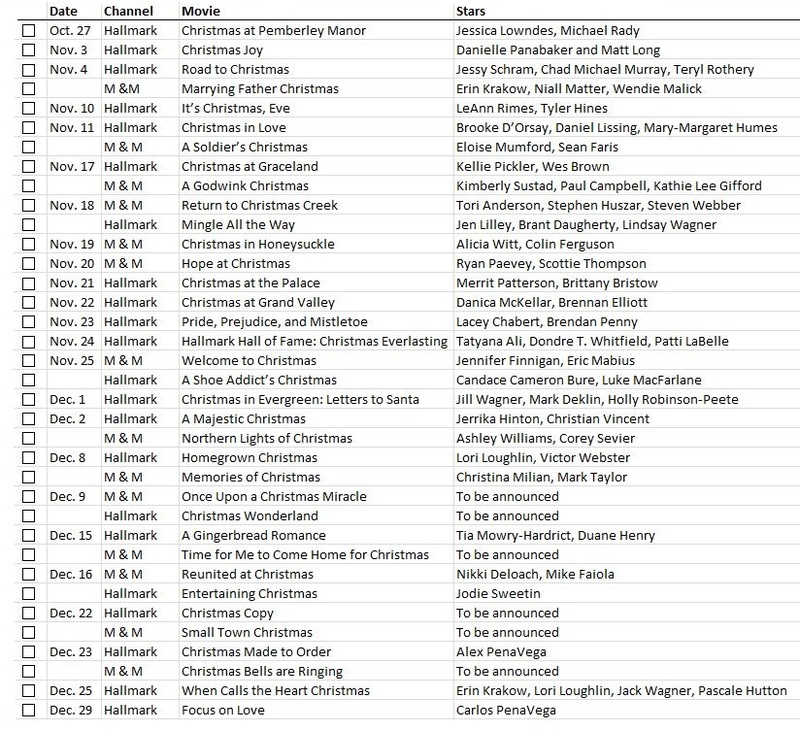 Twenty-two of the new movies will air on Hallmark (here’s the list), and 14 will appear on Hallmark Movies & Mysteries (and here’s that list). While I appreciate the separate lists, I decided to do one better and combine them into one, easy-to-reference, ultimate Hallmark Christmas 2018 guide! Note the checkboxes on the far left so you can keep track of what you’ve watched, and in the Channel column you’ll see that Hallmark Movies & Mysteries is simply called “M & M” for short. And, since sometimes names of the movies are so similar, I included a few stars from each movie (where details have been released) to help you keep them straight. Just print off a copy of this blog, trim out the guide, and keep it by your TV to reference for the entire month! If you missed the Christmas preview show back in July, you can watch it right now for some sneak peaks, but don’t pay too close attention to the dates—Hallmark has since made a few changes. The list above echoes the most current info. Finally, if you’d like a few plot details for each movie, Entertainment Weekly has a nice slideshow with details.